What it teaches: With FWCC you get a little more experience with strand-by-strand tightening (tightening the wrap along it's width, as hown in the linked tutorial). You also learn more about making a proper seat, which is discussed in more detail on our Wrapping Safety page. Extra bonuses: There are also a lot of FWCC variations, such as the newborn-friendly Lexi Twist, shoulder flips, fancy finishes, and modifications for short wraps (we'll get to short wraps below). What it teaches: The structure of FCC makes it feel like a pretty quick carry - because it can be completely pre-tied (unlike FWCC) baby can be "popped"in and out of the wrap with little adjustment. Extra bonuses: Another benefit of "poppable" FCC is that it can be tied on before leaving the house to avoid having to parking lot wrap. My only caveat with FCC is that baby sits in two cross-passes so if your baby pushes back away from you a lot (we'd call that baby a "leaner"), then use this carry with caution. Try both carries and pick one to master. Practice that carry as often as you can for several days, and make sure you tie the same way every time (for example, the first pass always goes over the same shoulder), that way you build muscle memory. Pay attention in the tutorials to when and where the carry is tightened and how the slack (extra fabric) travels into the knot. That way you can adjust on the go if things start to sag, and they probably will at first until you get the hang of tightening with just the right balance. What it teaches: Robin's it's nice because it tightens both across baby's back and across the wearer's back so it can be customized for a good fit fairly quickly. 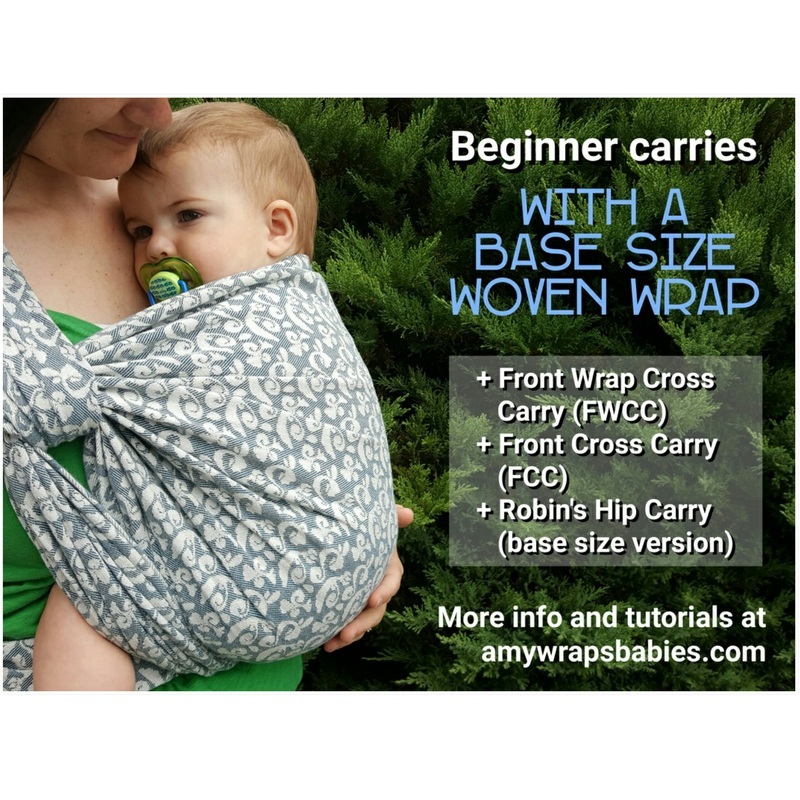 Typically, Robin's is tied with a shorter wrap, however in the linked tutorial, the extra length of the base size wrap is crossed under baby's bum, like in FWCC, and the bunched passes are tied behind you. Extra bonuses: Robin's is great because you get more practice with making a seat, it's another poppable carry that can be pre-tied, and the slack comes right across baby's back similar to a ring sling. What next? Check out the full list of Tutorials to see what you can do with a base size. If you want to start with a shorter wrap or step up to back wrapping, that'll be covered in my next two posts (and linked here when it has been published). Find more Resources and look for Support on the rest of amywrapsbabies.com!